You are off and running into 2018 and it's time to start thinking about different ways to grow your business and professional network this year. What better way to grow your network than to attend some local marketing and networking events in your area? If you're located in or near the Twin Cities, we have the perfect hit list of events for you to attend. Join Karen Graham of Idealware to explore the current landscape of low-cost donor management systems. 1 Million Cups is a free weekly event designed to engage and connect entrepreneurs in over 100 communities across the nation. 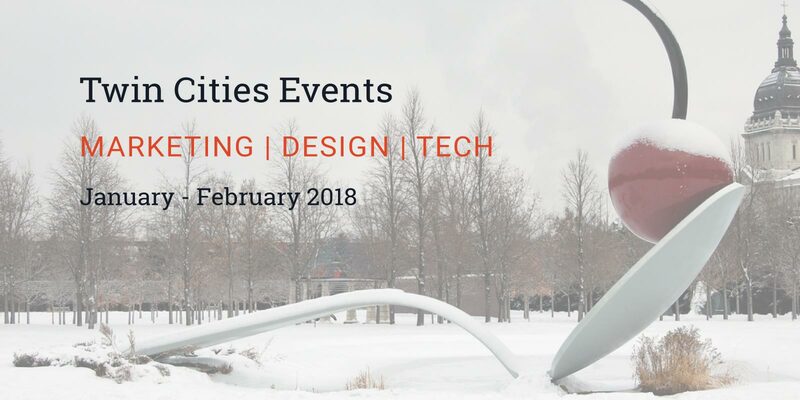 We are fortunate enough to have 2 local weekly events offered to entrepreneurs here in the Twin Cities. Digital strategist Tony Saucier will present and talk about social media strategies and demonstrating a clear ROI. Join AMA and Scott Severson, President of Brandpoint, as he breaks down the practice and systematic approach to content marketing. Join Healthcare.MN in presentations and conversations about new developments in sports medicine technology. A networking happy hour with BMA Young Professionals. A morning of networking and breakfast at Breaking Bread Cafe in North Minneapolis. Join AMA Minnesota and other Twin Cities marketers with a cup of coffee and conversation. Join WomenVenture for a panel discussion with female business owners who will tell their story of entrepreneurship. Join Smartpress and AIGA Minnesota in a conversation about Kevin Horn and his independent magazine.